It’s not good when there are predators that think your farm is a great place to party, mainly because they love the bountiful buffet. That may be a cliche, but that doesn’t make it any less true. 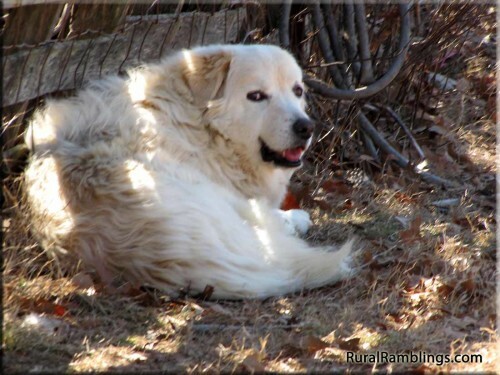 Although I have definitely been missing our Maremma Livestock Dog, Neffie, now that’s she is gone we have evidence of just how much she really did. Aside from the fact I loved her, and our personalities meshed … both being shy and not good around people… she was a tireless protector of the other animals that lived here. Now that she’s gone, we’ve had problems. Hens went missing… even those roosting in a tree. Guineas started going missing, and they roost near the top of a very tall walnut tree. Then one of our turkey hens disappeared. 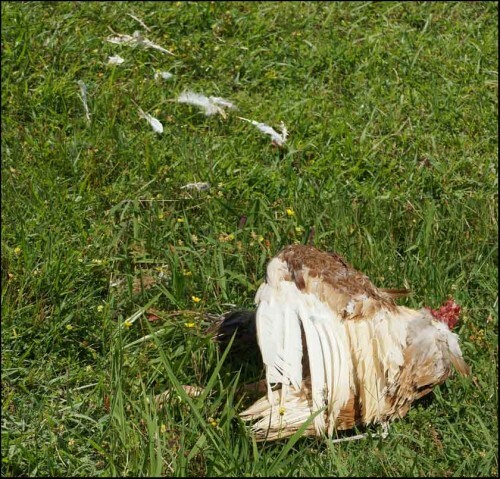 All we’d ever find were a few feathers. We finally surmised that whatever the predator was, it waited until early crack-of-dawn morning hours when all the fowl were coming down from their roost, then catch one for breakfast. 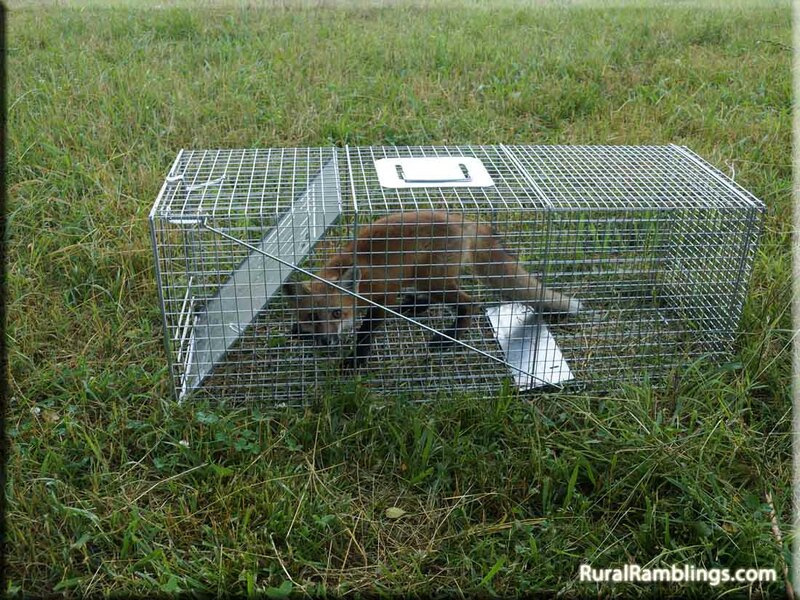 We’ll catch a little fox, And put him in a box. . .
One evening we got a glimpse of what we thought was a fox running up the side of one of the fences, so the Farmer decided the thing to do was get a live trap (obviously the trap isn’t alive… just means you catch the animal alive). The first couple of nights the stealthy creature would creep into the trap, eat the bait, and make it back out again. But the third morning we saw this. . .
Oh yes, a fox indeed. This little male seemed awfully small to me to be the cause of all our troubles! We’d never find a carcass, just feathers. How did he eat an entire turkey hen? Only thing we could figure is if he dragged it off into the woods where we wouldn’t find it. Of course, the disturbing alternative was that he had help. And this morning there was evidence that he was NOT a lone predator. Last night, there was a big turkey hen nesting in that spot. This morning… just a few feathers. I started following the feather trail to see if I could find where this critter was taking it meals. 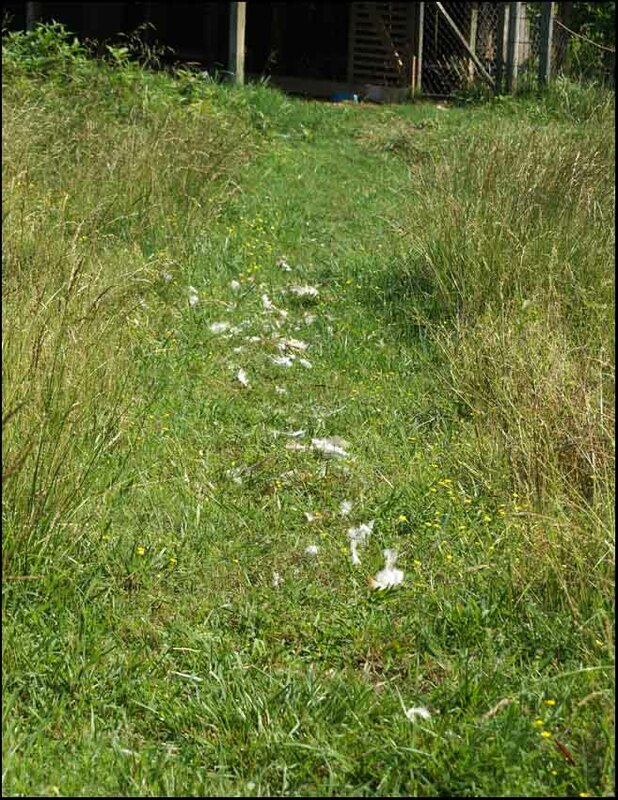 Once again, the biggest piles of feathers were in the goat and llama’s pen. Which upon reflection is a VERY smart place for a predator to go. It’s the ONE place on the farm that our farm collie, Toby, can’t get into at night. He can get in the sheep pasture, but the gates are all shut that go into that pen. 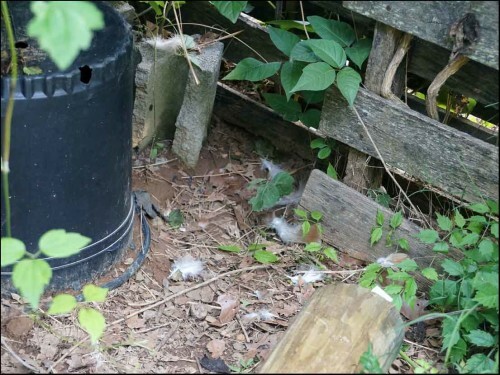 Which means a fox or other predator can go into that pen and eat in peace. Major bummer. And the big difference this time is that there was something left behind. Comparatively speaking, not much of something, but the remains were found. . . It would seem it’s time to bait the trap again, and see what else we can catch. There’s A Skink in My Sink!